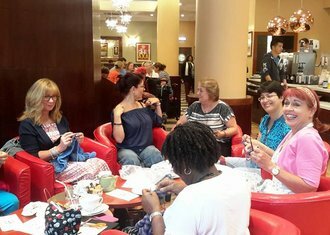 We are a national educational charity dedicated to UK domestic knitting and crochet, run by volunteers and supported by subscriptions and donations. We have members throughout the UK and a growing number of international subscribers. You don't need a qualification to join - we welcome all levels of expertise from beginners to experts and to those who have an interest in the history and future of these crafts. We are celebrating our 40th Anniversary in 2018/19 - so please take a look at what makes us special and come and join us. All Guild members receive a fantastic range of benefits, from local meetings with like-minded enthusiasts to exclusive pattern downloads and discounts - and plenty more! Times are tough on your local High Street. Do support our local Yarn Shop members and help them to continue to offer you all their "yarny" delights. Click trough to see if there's one near you! A fantastic range of Welsh and British artisan products and an opportunity to meet the wonderful people who made them. Great family day out with hands-on woolschool workshops and events. Find a Guild Branch Near You! The Guild has branches around the country and you'll be more than welcome to come along to any meeting to see what we get up to and find out more about our heritage collection of patterns and artefacts. Together, the Guild's members possess a vast collective knowledge, practice and expertise about the crafts of hand knitting, machine knitting, and crochet.